Each summer, Clean Foundation hires interns for a nine-to-15-week period to work various positions across multiple organizations throughout Nova Scotia. Clean provides these interns with the knowledge and tools to inspire and encourage actions that lead to positive environmental change, through their Clean Leadership Program. Daniel Robinson, a student of Environmental Sustainability at Acadia University, has spent three summers working with Clean, his last internship placement being with the NS Department of Energy. 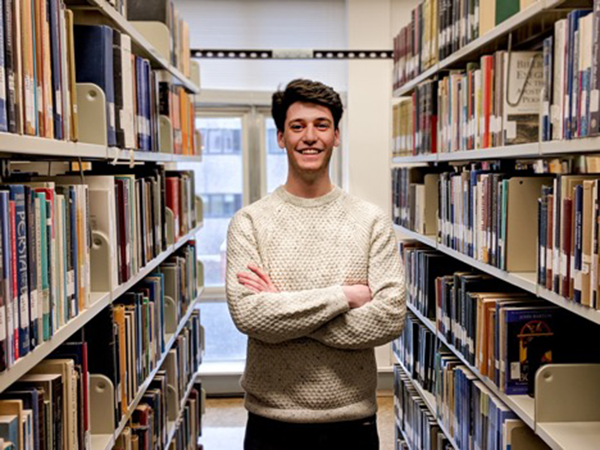 "There is nothing I would rather spend my summers doing," Daniel says. "I would encourage every single young person invested in the environment, sustainability or the green economy to apply and take advantage of possibly the best internship program in Nova Scotia." Daniel spent the summer weeks working on his project by going over policy and legislation that aided him in developing a strategic framework for collaboration between government departments. "Clean also facilitated a mentorship program which saw me paired with a professional with experience in politics – the sector I expressed interest in. This helped me to grow and plan for my future career," Daniel adds about the advancements made to his professional interests. At the beginning and end of the summer, Clean coordinates conferences where the youth leaders all come together to network and participate in workshops. This allows the interns to show off their hard work with pride, as well as expand their knowledge in the sustainability sector. The internship connects the youth leaders with lifelong mentors and peers to create a positive circle of influencers. Some connections made were life-changing, like for Ronnie Noonan and Olivia Barry. Ronnie and Olivia met through the Clean Foundation program, despite working with separate internship programs. Ronnie designed and facilitated Earth Education programs and camps for children that aimed to increase understanding and appreciation of the natural world. Olivia was the Sustainable Energy Program Coordinator at the Discovery Centre in Halifax, where she created programs about renewable energy relevant to Nova Scotia. Through her program research, Olivia came across an initiative that was attempted in coastal California. This organization wanted to put blue lines on waterfront property to bring attention to the urgency of climate change and sea level rise. As Nova Scotia is almost entirely surrounded by ocean, Olivia thought this would be an excellent initiative to bring to Halifax. Today, Ronnie and Olivia are united through this idea that they've brought to Halifax, called the Blue Line Initiative. "With the current state of the world, it is so empowering to meet like-minded individuals who care about the wellbeing and the future of the world as we know it," says Olivia. Without Clean, the two never would have met. "I would not have gained the skill set and network to pursue a position of leadership in my field. From my experience, I feel capable of applying my knowledge to some of the environmental problems that face our world today. This is what encouraged me to co-found Blue Line Initiative," Ronnie adds. Clean fosters a sense of leadership and responsibility in young environmental leaders to take matters into their own hands when they seek a solution to a problem. This internship program opened up new doors to the environmental sector and empowered all three youth to take charge and make change in their world.